An aeronautical engineer predicts that a new model of plane will fail catastrophically and in a novel manner after a specific number flying hours. Bill Lawrence wins a slew of prizes on a radio quiz program. His happiness is short-lived when he discovers he'll have to sell the prizes in order to pay the taxes on them. David Marshall Williams is sent to a prison farm where he works in the tool shop and eventually develops the precursor of the famous M-1 Carbine automatic rifle used in World War II. An opinion pollster finds a town which is a perfect mirror of U.S. opinions. A US Army Major stationed in East China in 1944 is ordered to blow up military installations in order to slow down the advancing Japanese Army. Newspaperman Royer convinces government officials of a plan to obtain rubber by stealing it out from under the Japanese. Carnahan is let out of prison to help. An ex-pilot and current baseballer is recalled into the U.S. Air Force and assumes an increasingly important role in Cold War deterrence. Shrimpers and oilmen clash when an ambitious wildcatter begins constructing an off-shore oilrig. Star major league pitcher Monty Stratton loses a leg in a hunting accident, but becomes determined to leave the game on his own terms. A father's attempts to protect his college-age daughter from trouble backfire and he finds himself in the middle of scandal after scandal. EXCITEMENT and SUSPENSE 18,000 Feet Over the Atlantic! Monica Teasdale: I would have stopped working a long time ago if I could have figured out what to do with myself. Evidently not many people have heard of this movie. I saw it when I was a kid in the 1950s and was impressed, being an aeronautics buff even as a child (and still so today). The story revolves around a new advanced design commercial airliner called "Reindeer", in service in the UK and an aeronautical engineer (portrayed by Stewart) who suspects that the aircraft might have a design problem that could result in a structural failure of the vertical tailplane from metal fatigue... an at-the-time relatively new field of science in aviation. After one of the airliners is lost in a crash (and the tailplane is not among the wreckage) Stewart's character (Theodore Honey) begins testing of a production tailplane in a large research lab, vibrating it to see if, after a carefully calculated number of hours of vibration, the tailplane will suffer a structural failure. His theories about the proposed failure of the lab test subject tailplane assembly after a select number of hours of vibration are reinforced by a similar number of flight hours on the first airliner that was lost, which confirms his convictions that the crash was indeed the results of a structural failure brought on by metal fatigue. The problem is that Mr Honey is a bit of a recluse and eccentric, a widower and single parent, and considered a bit of an odd duck by his contemporaries. However, he has credentials and his work is taken seriously enough to allow him to convince his employers to conduct the structural design lab tests, even though they do not really take him seriously on his metal fatigue theories and for the most part seem to be simply patronizing him... ...until Honey finds himself traveling via air and the airplane he gets onto happens to be a Reindeer... with enough acquired flight hours on the airframe to be dangerously close to the failure point according to his calculations. Honey, upon realizing that the airplane has the "required" flight time on the clocks to be in danger, embarks upon a quest to do something about it as only an eccentric genius can, and the story takes off from there (again, no pun). The combination of a laid-back American actor like James Stewart and a somewhat abrupt British cast tends to accentuate Stewart's Theodore Honey, a normally reserved but very absorbed engineer caught up in his work, surrounded by a pack of hustle and bustle Brits. It's quite a contrast. Good support from Glynis Johns as the stewardess aboard the Reindeer and Marlene Dietrich as movie star Monica Teasdale, also a passenger aboard the airplane, both of whom get caught up in Honey's apprehension and fears of an impending disaster that he is certain is staring them in the face, although nobody else really takes any of it seriously... until Honey takes matters into his own hands after the airplane lands without incident and he learns that it's scheduled to remain in service in spite of his rather uncharacteristically loud and spirited pleas to have it grounded. His solution to keeping the airplane grounded until his lab tests are concluded is certainly an interesting turn of events. Considering the vintage of this film (1951) it has decent F/X and remains a bit of a period piece, demonstrating how air travel used to be done before mass transport Jumbo Jets and economy class seating. This film is an aviation enthusiasts sort of movie as well as a story of the little guy who believed in his convictions and the few people around him who believed in him as a person... even though they may have doubts about his work and his theories. Good cast across the board, with some standouts like Jack Hawkins who is always fine, and Marlene Dietrich who at first seems to be there solely as Star Appeal although after a bit of time passes, her presence becomes more and more genuine. There is some good character development in this film, albeit sometimes a bit rushed and the ending is also rather abrupt... but typical of many British films of the period. All and all, it's a film well worth watching for the fine performances and the engrossing story... and as a sidenote, for the look back at the way the fledgling airline industry and how it was coming into its own. It also inadvertently provides a sobering point to ponder since this film was produced several years before the British De Haviland Comet jet airliner entered service and disastrously became aviation's first great example of the potential for a catastrophic structural failure caused by a design fault, which although corrected quickly, still didn't save the airliner from the stigma it suffered when several crashed after they experienced explosive decompression at high altitude from something as simple as having cabin windows too large and the wrong shape. 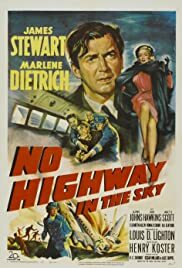 The British airline industry must have collectively flashed back to this film during the mid-1950s and the Comet's woes, and how prophetic "No Highway In The Sky" must have seemed at the time. This film also includes some considerable supporting talent, almost all of which went uncredited, such as Kenneth More and Wilfrid Hyde-White. 60 of 62 people found this review helpful. Was this review helpful to you?